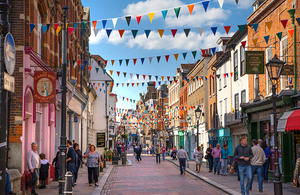 High Streets Minister Jake Berry MP said: ‘BIDs have a proven track record of upgrading commercial areas to enable business owners and entrepreneurs in our town centres and high streets to thrive. …There are now over 300 BIDs across the UK and the Loan Fund that the government set up has been vital in helping key BIDs to emerge. Thus far 29 loans of between £10,000 and £50,000 have been allocated through the British BIDs application process, and BIDshave been able to use this loan funding to develop their proposals and support the ballot process. Last year the town scooped the prize for England’s best high street at the 2018 Great British High Street Awards. Altrincham was recognised for its ‘ongoing events throughout the year to drive footfall to the local high street’, which the town’s Business Improvement District Altrincham Unlimited has done much to lead.